All major browsers and devices supported, providing you with the highest level of security and compatibility with 99.9% of the world's internet population. The most recognised trust marks on the internet. 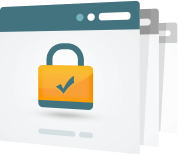 Our unlimited re-issuance policy means that we will reissue your Certificate free of charge for the life of the SSL Certificate validity, for any reason. 256-bit encryption provides the strongest SSL encryption available on the web.